National Council of Churches in India: Chattisgarh Christian Council condemns vandalism and assault on church members in Kachana, India. 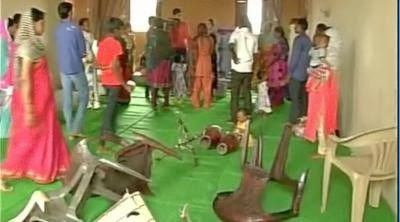 Chhattisgarh Christian Council (CCC), regional Christian Council of the National Council of Churches in India, strongly Condemns the Vandalisation of Church and assault on Believers Chhattisgarh Church and subsequent assault on the church members in Kachana near Raipur city. The attack happened around 11 am on March 6, 2016 allegedly by members of Bajrang Dal. The Pastor Ankush Bareyekar approached the Vidhan Sabha thana where the police after a long delay registered the FIR. 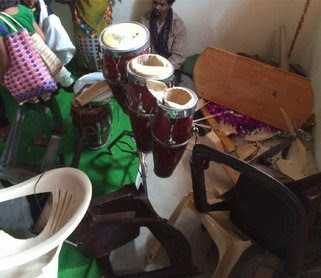 According to Bareyekar’s complaint to the thana incharge, around 11 am while the members were having a worship in the church – commonly known as Maseeh Satsang Samooh – about 30-40 people forcefully entered shouting ‘Jai Shri Ram’, assaulted the church members and vandalised the church property including chairs, table, fans, etc. Apart from this, the pulpit was also smashed off by the hooligans. In this unexpected attack, several people including women and children have sustained serious injuries. Those seriously injured are Hem Kumar, Sanjay, Dinu Rakesh, Lakeshwar Manju and Bimla, while others have sustained minor injuries. While one of the woman members was attacked, attempts were made to disrobe her by tearing her cloths. This is not only a matter of molestation rather it is a serious matter of sexual assault. There are reports that a five year old mentally challenged child was thrown down to the ground. Police personnel were reluctant to accept and register it as a matter of communal attack on Christian minority by the ‘fringe elements’. According to Rev.Samsher Samuel, President CCC and Rev.Atul Arthur, Secretary CCC and Mr. Arun Pannlal, Forum President, this is the fourth one in a series of attacks in the past one month on Christian minorities in Chhattisgarh. The other ones were in Pithora (Mahasamund district), Abhanpur (Raipur district) and Korba. While in Pithora the FIR was very weak, no FIR has been filed in the Abhanpur incident till date. In Korba where the church was attacked, instead of providing protection to the victims, an FIR was filed against the pastor of the church. These are not isolated cases in the state. In the past there have been a number of incidences where the constitutional right to freedom of religion has been interrupted, particularly by the communal Hindutva forces. The police and administration under the pretext of ‘avoiding communal conflict’ always sides with such anti-Constitutional elements and framed the victims as the perpetrators. 1. Immediate arrest of the criminal perpetuators in this case. Since the vehicles have been seized by the police, it should not be a difficult task for police to trace the culprits. 2. Provide protection to the victims. 3. All attempts to frame the Christian believers in fabricated cases should come to an end. 4. Compensate the damages done to the church. 5. Provide free medical aid to the injured. 6. Create an atmosphere where communities with differing faith and religions enjoy the freedom of faith and religion without fear, terror and pressure from majority groups. CNSSS would conduct a detailed fact finding investigation soon and come up with a report. There would be a press conference after which a strong protest would also take place. Secretary, Chattisgarh Christian Council, NCCI.